Let’s face it there are places we have to be during the week and destinations where we want to go during the weekend and we are all trying to get there the most efficient way possible. The 2019 Honda Fit and the 2019 Toyota Yaris help you get more done during the day while sipping the gas the entire way. You can see the differences between the standard performance specs, interior dimensions, as well as the standard & available cabin comforts for the 2019 Fit and the 2019 Yaris right here below. This side-by-side comparison can help you figure out which one of these efficient compact cars is right for you. What are the Differences Between the 2019 Honda Fit & the 2019 Toyota Yaris? 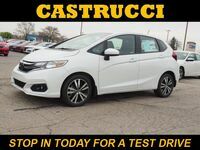 Both the 2019 Honda Fit and 2019 Toyota Yaris offer an automatic transmission upgrade from their standard 6-speed manuals. 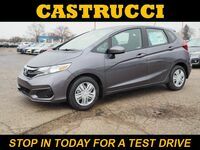 The 2019 Honda Fit offers a Continuously Variable Transmission (CVT) on its lower three trim levels and the CVT is standard equipment on the top trim level of the 2019 Honda Fit. A 6-speed automatic transmission is available for the 2019 Toyota Yaris but it is only available on its top trim level. Both automatic transmission upgrades increase estimated EPA fuel economy ratings. 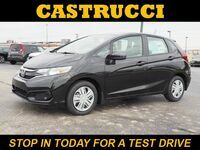 There is spacious seating inside the cabin of the 2019 Honda Fit and the 2019 Toyota Yaris but the 2019 Fit has 95.7 cubic feet of standard passenger space and the 2019 Yaris only has 85.9 cubic feet. The 2019 Honda Fit also has more rear seat headroom and legroom than the 2019 Toyota Yaris. There is 16.6 cubic feet of standard trunk space in the 2019 Honda Fit while the 2019 Toyota Yaris only has 13.5 cubic feet and the 2019 Fit also has more available cargo space as well. You can find touchscreen displays in the 2019 Honda Fit and the 2019 Toyota Yaris but the standard screen for the 2019 Fit only measures 5” while the standard screen of the 2019 Yaris is 7”. 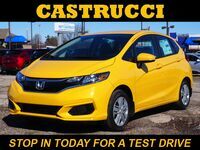 The 2019 Honda Fit, however, does receive a 7” touchscreen on all but its base trim level and the top three trim levels also get equipped with standard Apple CarPlay™ & Android Auto™ which are two features the 2019 Yaris does not offer.